The birth chart also called as the natal chart or the astrology chart is a pictorial representation of the position of the luminaries Sun, Moon and the other planets. It is done for a particular time of birth and place of birth and hence the birth charts vary from individual to individual but for twins. In Indian astrology, it is termed as the Janma Kundali and gives the exact position of the stars when you were born. Astrologers can then interpret the planetary positions for the native. Also the time of birth determines your Ascendant or Lagna which is the first house. This forms the basis for the other house positions. The natal chart forms the foundation on which a native is studied or analyzed as it contains all the planetary placements and their angular displacements with respect to each other. The zodiac house where the Moon is placed is termed as the "Rasi" in Indian astrology and holds greater significance than the Sun sign which holds prominence in Western astrological calculations. The various planets take on various qualities and characteristics based on where they are placed in the birth chart for a particular person. A birth chart is also called as one's Horoscope. 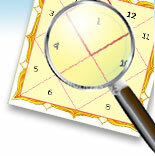 The horoscope plays a significant role in many traditions and countries. It is widely used in synastry calculations where relationships are studied. In a birth chart, the first house also called the Ascendant rules the personality or nature of the native. The 5th and the 9th houses are called as Trine and are auspicious. The 4th, 10th and 7th houses are called as the Quadrants and are related to one's fortune in general. The 3rd and 11th houses denote the growth of the native. The 6th and the 12th houses are found to be quite malefic for the individual. The sun-sign is the most important entity in the birth chart. The Ascendant or the rising sign holds the next important position and then comes the Moon-sign. The planets in a birth chart show what is happening, the signs where they are placed show how it is happening and the houses show where it's happening.